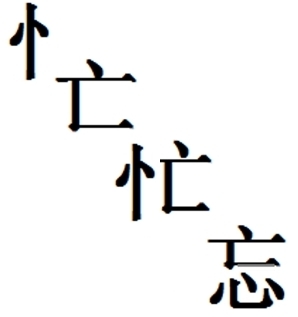 Chinese characters occasionally say a lot symbolically in the arrangement of their parts. These ‘parts’ are simpler characters composed of a few strokes (lines). These simpler characters are put together to form the thousands of characters in the Chinese language. The meaning of the component parts of words (or characters) can be revealing. For example, decades ago I wondered what the word religion actually meant and so looked it up in the dictionary. I found it was composed of two parts, re: back again, anew + ligāre: to bind, tie. Thus, religion simply means to tie back again, to reconnect. Seeing it broken down really illuminated the primary role of religion for me. Interestingly, the word yoga (from Sanskrit: a yoking, union, from yunakti ‘he yokes’) shares a similar meaning with religion. This makes all religions profoundly similar; the differences are merely superficial matters of style, so to speak. I doubt few people who debate the merits or truth of one religion over another, actually know this core meaning. If they did, the discussion would be less debate and more introspective… perhaps. Likewise, I’ve noticed that native Chinese speakers don’t ‘see’ these component parts, but just take the word at face value. The same occurs with all native speakers I suspect, like me with the word religion. We seldom wonder how the words we’re using to think our thoughts came about in the first place. In my view, that is building ‘castles of thought’ in the murky quicksand of ignorance. Garbage in, garbage out, as they say. Now, take a moment and ponder the characters below. The first and the last are actually formed from combining the two middle characters in two different ways. See if you can see what I had mind when I titled this post, Mind Run Away; Run Away Mind. These also give insight on the nature of “busy” living. máng (忙) busy; fully occupied; hurry; hasten; make haste. wàng (忘) forget; overlook; neglect. 有 (you) have; there is; exist. 意 (yì) meaning; idea; wish; desire; intention; expect; suggestion; hint; trace. 思 (sī) think; consider; deliberate; think of; long for; thought; thinking. Two of these characters 意 and 思 use the character for mind which you saw earlier above, i.e., xīn (心) along with another character, 音(yīn) sound; news; tidings; tone and 田(tián) field; farmland; cropland respectively. Seeing this interrupts shallower understanding and induces me to consider meaning, idea, desire, etc., as being sound + mind/heart and thinking, consider, deliberate, etc., as being field + mind/heart. This helps me escape my ‘box’ of preconceptions a little bit more.